How i find IP "x.y.z and a.b.c"
You should read all volumes ! Do not skip any question. Nope ! There aren't any update or new questions added. First of all i would like to thank you for being there. Scored 1000 in BSCI. 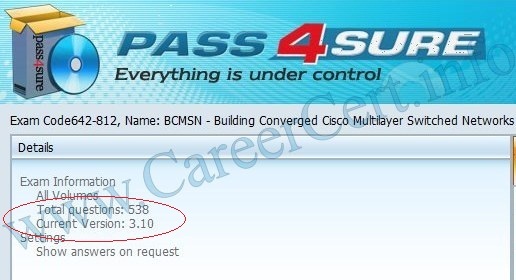 I wanted to know if there is any update or any extra question that has been added to BCMSN. I have v3.10 with 538 questions, wanted to know if there is any additional question added to this later. Preparation labs is a different product and the above GB is for a different product. Moreover p4s preparation labs is a useless thing. Alternate download links has been sent. I have just contributed $16 for getting the P4S GB . However the download link in the rapidshare is not working.Please advise. Hi CareerCert! Paybal payment form is not showing my Country in the list… what to do? If you are SURE that a particular answer is wrong then you should use the correct answer according to your knowledge. hi careercert, many answers in the section "Updates" of this dump seems wrong… should we use the wrong answers in the exam or change it to correct one??? This one is latest and no need to buy test inside because it is already available. It is recommended to practice from both. thanks careercert!!! I bought p4s….. is it sufficient or should i buy test inside as well??? Finally i succeded and got the p4s. Just want to know is there any update? Also i am trying to make the payment but paypal is not accepting my card please i want this p4s and i am ready to contribute through Moneybookers.com please give me the details. Yes , the explanations are covered in PDF from question #1 to 446. Rest of the updated qs doesn't have explanations. Labs are not simulated in exam engine too. Solutions are given as plain configuration commands. This PDF is exact copy of setup engine. Hi, Is the explanation also present in the pdf?? also how are the lab questions simulated in the pdf?